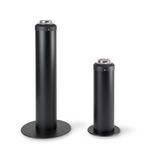 A high tech filtering system allows the AirQlean Slim™ to capture, clean and fully purify the air before recycling it back into the greater environment. AirQlean Slim is the ideal choice for those looking to maximize the capturing and filtration of tobacco smoke in their smoking room or smoking areas. By integrating the ashhandlingsystem with the filter cabinet we encourage the smoker to get close to the capturing zone also makes the AirQlean Slim an ideal solution in smoking areas with limited space. 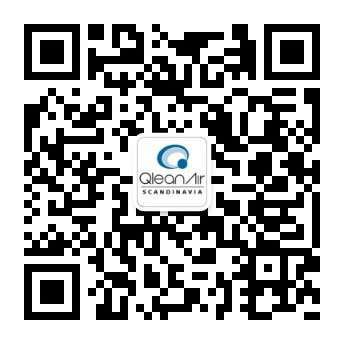 AirQlean Slim is a “all-in-one” combination of air filtration and ash handling in one product. It is based on our QleanAir cabin with the same air filtration efficiency. 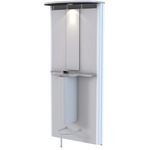 AirQlean Slim is floor standing and requires wall mounting. 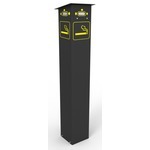 This unit is a modern all-in-one Solution For Removing Smoke and Handling Cigarettes and Ash in Smoking Rooms. * A ceiling height of at least 2300 mm is needed for assembly.